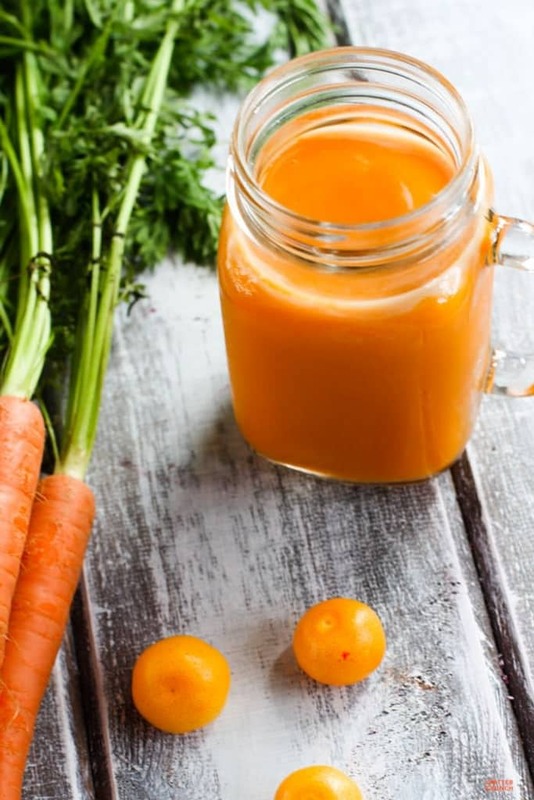 This orange carrot coconut smoothie is an immunity boosting smoothie recipe. 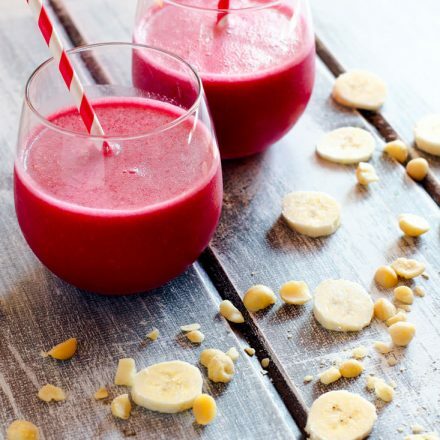 Naturally sweet, refreshing, and full of antioxidants, these healthy smoothies are the perfect healthy breakfast drink! 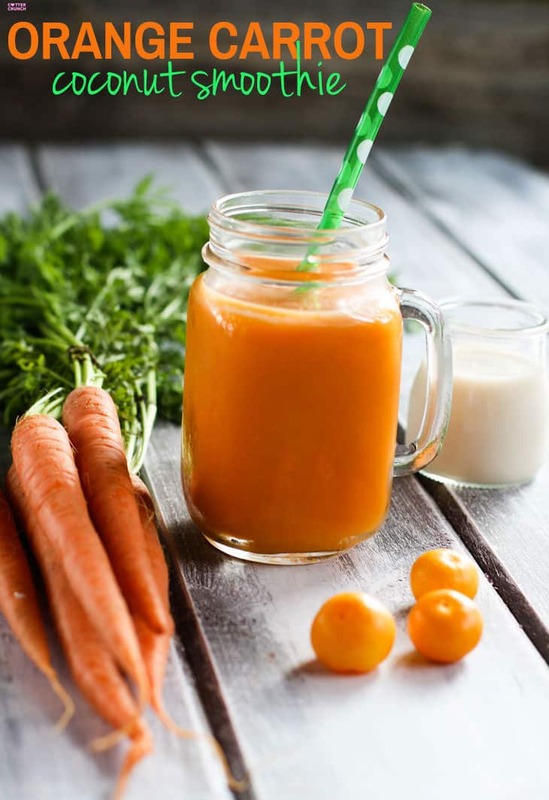 There are 3 reasons you might be needing this immunity boosting orange carrot coconut smoothie recipe today. One –> You’ve been traveling all weekend and need and are in dyer need extra antioxidants to fight those free radicals. Two –> You raced this weekend and you need extra anti-inflammatory nutrients to boost muscle recovery. And three –> You’re doing the best you can to start the week off STRESS free and full of nourishment. The carrot has been called the poor man’s ginseng as it contains more than 400 phytochemicals. 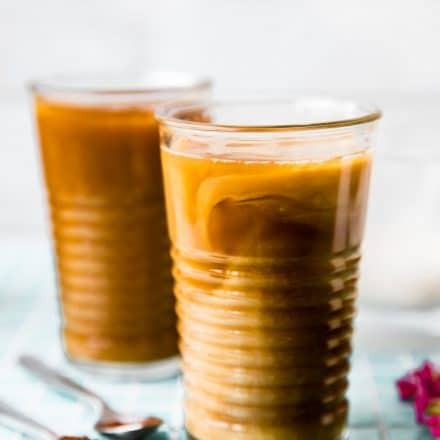 Okay fine, FOUR –> if you are like me, you rotate your smoothies (due to high oxalates) and you just get tired of drinking the same old green smoothie. Yes, we need more COLOR! Bright VIBRANT ORANGE COLOR. This orange carrot coconut smoothie is as orange as orange gets! Which is why I swapped out the spinach for the carrot juice. Yes, I’m on an orange kick this week, and for good reason. More bang for your buck with the juice here –> an excellent source of pro-vitamin A, vitamins C, D, E, K, B1 and B6. Not to mention trace minerals like biotin, potassium, calcium, magnesium, phosphorus, and sodium. Throw in some more Vitamin C with oranges and probiotics with Coconut kefir or yogurt and you’ve got yourself one SUPER DUPER IMMUNITY BOOSTER. Yes, I rhymed. It’s needed on Monday. Bonus blend –> for digestive support, add in the frozen pineapple. Pineapple contains Bromelain, a digestive enzyme that can also help reduce inflammation. Feel free to add in vanilla protein to make it even creamier or protein packed. I buy from My Mix Nutrition. But in all seriousness, this orange carrot coconut smoothie is legit. Naturally sweetened with the carrot juice and orange. Creamy, so it almost tastes like an orange dreamsicle… almost. And just darned pretty. Can you see all that colorful nutrient dense goodness? Oh my! Feeling better already! I’m a sucker for pretty drinks. Oh and did I mention that the oranges in this orange carrot coconut smoothie came from my parents tree? That has to count for extra nourishment and love, am I right? So there you have it. Our new smoothie obsession. For now at least. Let’s hope it keeps us in tip top shape as we tackle the week. It has too because my father in law comes in town Thursday from New Zealand. We’ve got a weekend of shenanigans and probably some Mexican food consumption to attend too. What’s your favorite non green smoothie recipe? KEEP ME POSTED ON YOU! LET’S STAY CONNECTED. SO VIA FACEBOOK, INSTAGRAM, PINTEREST, AND TWITTER. I need this smoothie for all of those reasons! This looks fantastic. Gotta go get me some carrot juice so I can make this! You know me — I keep it simple as can be! Strawberries, banana, organic skim milk, and Vega Sport Recovery Accelerator (I usually only have smoothies post-workout). This smoothie looks awesome Lindsay. I never would have thought to put coconut, orange and carrot together but I am excited to try it! Isn’t it fascinating how incredible the humble carrot is!? I love this creamsicle flavored smoothie and that it will set me straight after the weekend. It is just what I need! yummmmm! I had no clue that carrots were “the poor man’s ginseng”! 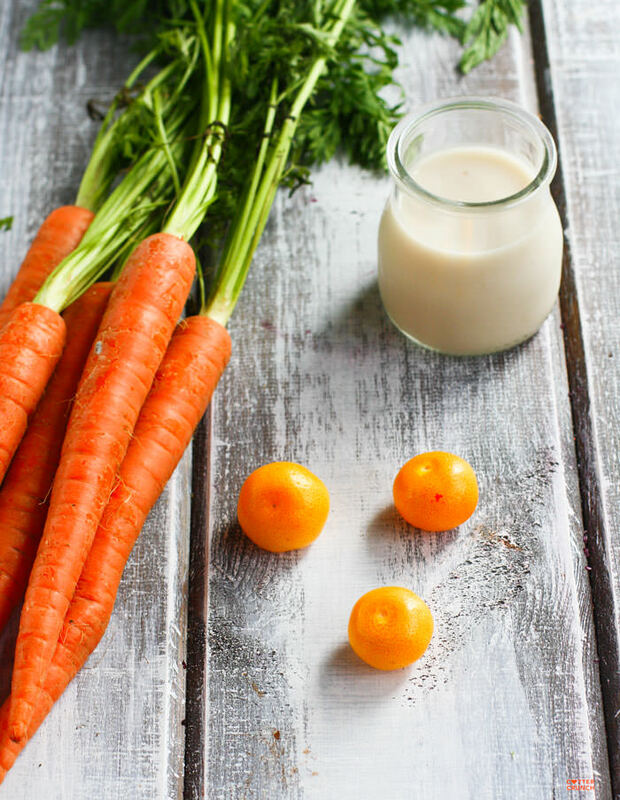 I haven’t been eating my carrots here lately – life has been very green heavy – but dang this smoothie sounds so good – loving the coconut milk in it! Love! I bet I could just throw the carrots and orange in my Ninja! Love oranges, carrots and coconut and have been “dying” of a sinus infection for over a month. Looks like it’s time to make me this smoothie! I love this!! I love orange/carrot together, but I never thought of adding coconut. Brilliance. YES. Okay, so I had a mango sorbet thing last night (dairy free gelato) and thought how good it would taste with some milky addition- this could quash that AND added nutrients! 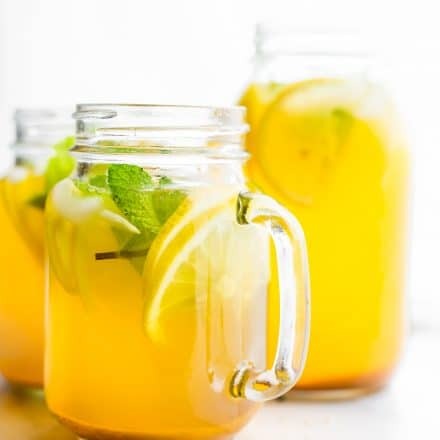 This sounds so refreshing! I don’t think I get enough carrots in my diet so this would be a great way to do it! Now this is a smoothie I would actually try! Such a beautiful color & very yummy looking!!! I still want to say how beautiful your pics are looking – awesome! thank you for always hosting! This looks delicious. You just reminded me that I need to have my daily smoothie. I ran a half yesterday and my knee is bothering me so I just need all sorts of nutrients and deliciousness ASAP. Thanks for sharing! Yes. Yum! I had a glass of fresh juice for the first time in months and added carrots. Which got me thinking about how good an orange smoothie would be. And here is the perfect recipe! Can’t wait to try it. I love orange & carrot together. I swear your pics are getting better and better. you are kind. thank you! p.s welcome home! xxoo looked amazing in CO! This looks amazing – and not just because your photos are so pro! What a great combo of carrot & coconut! Wow! That looks delicious! 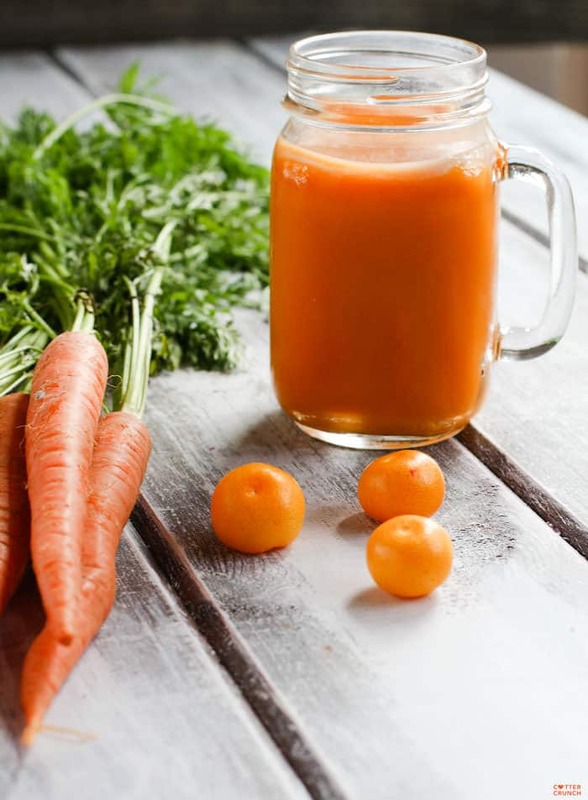 I’ve never had carrot juice before…do you buy it at the store or juice it on your own? sometimes i juice it, when i have a lot of carrots. but I’ve also bought carrot juice and just blended it. depends on my mood and budget. haha. Oh i need to get on the carrot juice train immediately! What a fantastic recipe, and I love the color! It does look so pretty! I love carrots. Sounds like a fun weekend ahead, enjoy!! yes, come join! we need to meet. Okay? hugs! 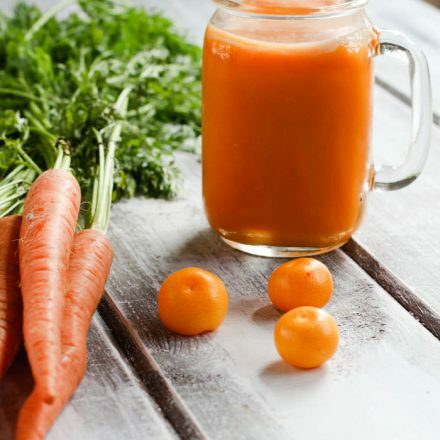 Carrots are one of my favorite vegetables, and it’s been a while since I’ve added them to a smoothie! The combination of the carrot and orange is so colorful and flavorful! This is gorgeous and carrots right from your parents tree definitely counts for extra bonus points. Missed you this past weekend at Blend. yum!! 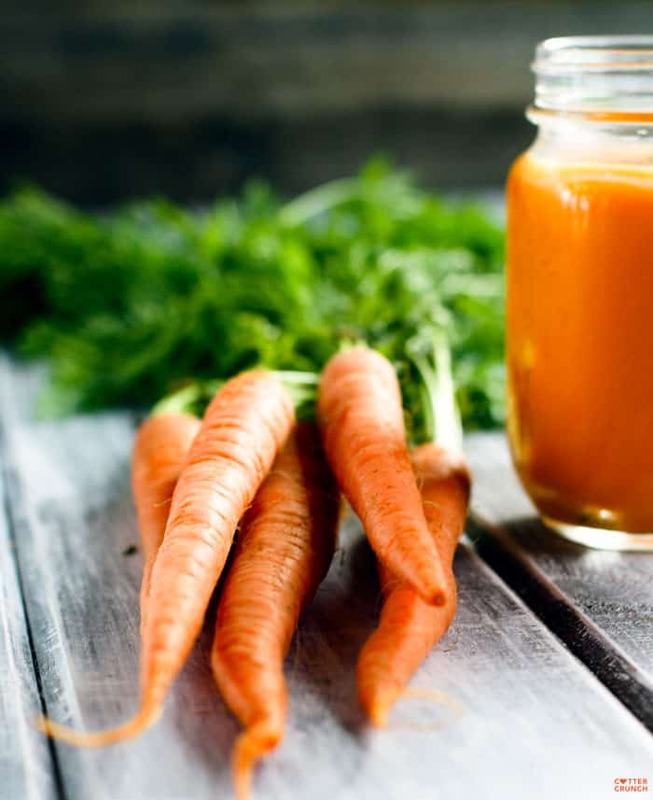 it’s been forever since i’ve added carrots to a smoothie – i need to get back on that train – yours looks gorgeous and so good!! I feel like this is just what we need this week. We aren’t sick but I have that feeling. 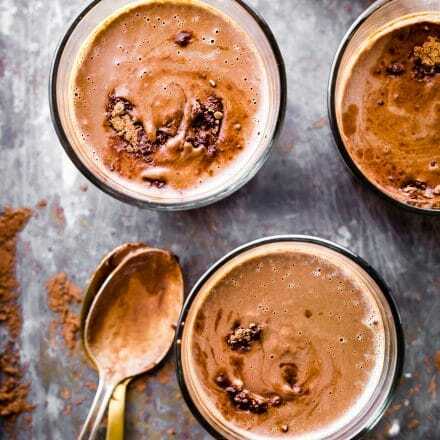 After being out in the rain this weekend at Sammie’s soccer tournament, this morning waking to cold and rain and temps today in the 40s, gymnastics and soccer keeping us busy every night this week and the girls track and field day at school….. we need to keep our bodies fueled and our defense up! Yum!!! The color is so beautiful and coconut kefir sounds delicious!! Yum. And yes, so pretty! Wow! I love this flavor combo and I defintiely don’t use enough carrots in my smoothies, but I should because they’re so yummy. And coconut?! Deal sealer. Da man friend would like this one, and he is NOT easy to please – that’s for dang sure! (you can see that in my latest post – ha ha ha)…. Reason #5 to enjoy this smoothie: To compensate for the amount of wine I consumed over the long weekend 😉 It was worth it though, delicious wine and BBQ, a combo that’s hard to beat. I’m always up for anything with the work coconut in it! And the color is so bright and happy! One word=Healthy 🙂 You think my kids would like this, even if they are not into vegetables or even carrots? I feel like I really need to down one of these to kick off my week now that I’ve seen it! you can use plain yogurt too! or kefir yogurt from whole foods is delish! Lindsay your orange carrot coconut smoothie is just gorgeous! I know if I started my day out with this I would feel energized all day. Loving your beautiful photos! Sharing and pinning, of course! I don’t have coconut yoghurt but I have plain. Making this for brekki now. Pinning! that would work too! Go for it Nagi! Ah! I was wondering how you cot the carrot to blend up to smoothie consistency. Juice works. I’m sure I’d especially enjoy this with a cup of fresh pineapple blended in. Thanks for sharing your recipe. Oh dear. I couldn’t see the tiny print in its almost white font when I filled in the comment form and missed that typo. Can’t see this time either. Hope I’m not filling the space up with more! oh no, what was wrong with the font? i’ll fix it. and thank YOU!